This provides us an eyeball on some of the simple things that can be done out in face of dry conditions. The advent of farm machinery made a range of strategies possible and not yet enough time to sort them all out. Thus work like this provides real guidance outside of traditional sources. The simple idea of rolling the top of the soil is one such. Spacing trees better is another obvious move that should have long since been adopted. We need to rethink grading so as to capture the added value of water stressed food in general. It is obvious that a massive root system will produce better quality and that a simple ABC grading system will capture that. There is a really good reason why the wild cousins always taste better. It is also core to organic crops. Farmer David Little of Little Organic Farm grows potatoes without irrigation in a dry part of California. This week, as the nation grapples with the worst drought in decades, the USDA added more than 218 counties to its list of natural disaster areas, bringing the total to 1,584 — more than half of all U.S. counties. Farmers in the Midwest and Great Plains have been the hardest hit, but the drought is a growing reality for farmers across the country, including California. While the secretary of agriculture won’t comment on the drought’s link to climate change, it’s at the forefront of everyone’s mind, and as global warming unfolds, knowledge of dryland agriculture will become increasingly valuable. David Little of Little Organic Farm has had to adapt to water scarcity in California’s Marin and Sonoma counties, where most farmers and ranchers rely on their own reservoirs, wells, and springs, making them particularly vulnerable in years with light rainfall. 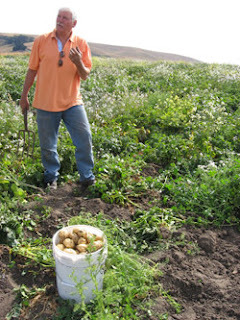 Through a technique known as dry farming, Little’s potatoes and squash receive no irrigation, getting all of their water from the soil. Mediterranean grape and olive growers have dry-farmed for thousands of years. The practice was common on the California coast from the 1800s through the early 20th century, but it became a lost art during the mid-century. Today, it is experiencing a modest resurgence along the coast, where temperate, foggy summers offer ideal conditions for dry farming grapes, tomatoes, potatoes, cucumbers, melons, grains, and some tree fruit. To find mentors, Little made the rounds at local bars, asking older farmers about their experiences. “They were very humble,” he says. “They told stories about how things were done, and I would pick up tidbits.” After years of trial and error, he now considers himself an expert. To help people understand how dry farming works, Little often evokes the image of a wet sponge covered with cellophane. Following winter and spring rains, the farmer will cultivated and break up the soil to create a moist “sponge.” Then the top layer is compacted using a roller to form a dry crust (the “cellophane”). This three- to four-inch layer, sometimes referred to as a dustmulch, seals in water and prevents evaporation. “It’s very challenging because you have to hold the moisture for long periods of time, and you don’t know how different crops are going to react in different areas,” Little says. Much of the land he farms is rolling hills and valleys, which present additional challenges because they hold and move groundwater differently than flat land. Deprived of any surface irrigation, dry-farmed plants develop deep, robust roots to seek out and soak up soil moisture. Because they absorb less water than their conventionally irrigated counterparts, dry-farmed crops are characteristically smaller but more nutrient-dense and flavorful. Having wide orchard rows, which allow tree roots to spread out, is essential for dry-farming apples, as is thinning (removing much of the fruit early in its development) to ensure that each apple gets as much water as possible. In drier years (like this one), Devoto must work extra hard to control weeds, which drink water needed by thirsty trees. As the summer progresses, the ground slowly dries out, stressing out the fruits as they ripen, which helps the sugars become more concentrated. But while water conservation and intensely flavorful crops are the clear benefits of dry farming, the major tradeoff is yield. Devoto says that apple growers in West Sonoma County, which was once home to a booming apple industry, only get about 12 tons per acre, compared to 30 to 40 tons produced by large apple farms in the state’s Central Valley. Similarly, Joe Schirmer of Dirty Girl Produce says that his famous dry-farmed Early Girl tomatoes sometimes yield only about a third of what their irrigated counterparts produce. Meanwhile, Little estimates that he gets about a quarter to a third the yield of large organic potato growers. “It it’s hard to compete with some of these big organic farms that are watering,” he says. Brie Mazurek is the Online Education Manager at the Center for Urban Education about Sustainable Agriculture (CUESA), which operates the San Francisco Ferry Plaza Farmers Market. She is also a consultant for Nourish, a nonprofit educational initiative designed to engage people in the story of our food. This is very interesting. I remember in the drought of 1976 in the UK strawberry farmers were going back to using horses because they did not compact and damage the top layer of the soil as heavy tractors do. Preparing the land for planting a large vegetable garden or crops can seem like a daunting task. Don’t get overwhelmed! For small acreage under 2-3 acres, you can use a PTO-driven tiller on your tractor to till the soil. You can also hire someone to do the plowing, disking and harrowing.